The elephants at Ringling Bros. are finally getting out of the ring and off the railroad. After a long tenure in the circus, what lies ahead for Ringling's biggest stars? Clearly, the center is leaps and bounds away from the life of a traveling circus elephant, which involves being locked in a boxcar for days on end, performing tricks for a crowd and standing on hard concrete that can cause severe foot injuries. But how does their retirement home stack up? For one thing, it's big. Delcianna Winders, deputy general counsel for PETA, told The Dodo that the space has great potential - but it's not using it yet. "They tout a large amount of space, but it's not always available to the elephants," she said, adding that right now, the animals are often kept in smaller areas so they can be trained - which may be less of a focus once they're no longer performing in circus acts. There are about 40 elephants living at the center now, and 13 are set to join them. In the past, the center has come under fire for its training programs, particularly for its use of bullhooks on the elephants, including babies. The company hasn't announced any change to their policy of using bullhooks, or sticks with sharp metal hooks at the end. 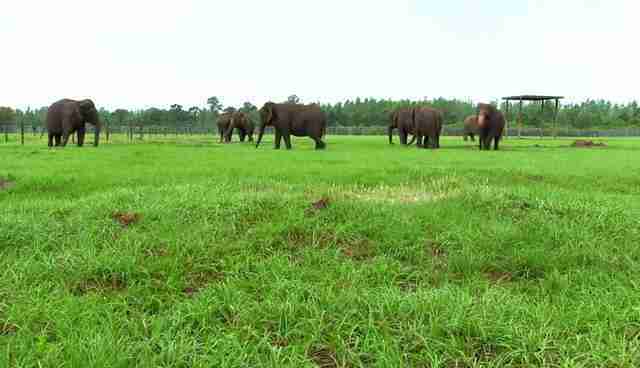 Feld Entertainment, the company that owns Ringling, hopes to turn the park into a facility that people can visit, where the elephants are breeding but have a large tract of land on which to roam. Kenneth Feld, the company's president, told the AP that the center will be open to researchers and he "hopes it expands to something the public will be able to see." 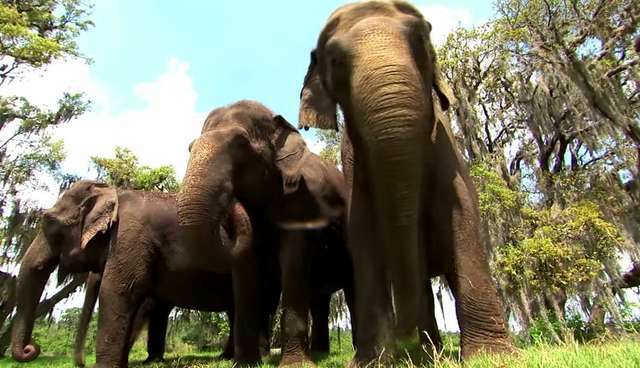 "I want everybody's grandkids to be able to see Asian elephants," he said. Feld Entertainment did not respond to The Dodo's request for comment. Not all sanctuaries use bullhooks to control their elephants, and many animal advocates hope that Ringling will phase them out, too. At the Elephant Sanctuary in Tennessee, the country's largest natural habitat refuge for elephants, a technique called "protected contact" is used to control the animals while allowing them to make decisions on their own. There is always a barrier between caretakers and elephants. "I don't think that using bullhooks should be an option," Margaret Whittaker, the sanctuary's director of elephant care, told The Dodo. "Everybody should be doing protected contact." She applauded Ringling's move, but said that it needed to add to the Florida facility to accommodate all the incoming elephants. And she also noted that the sanctuary, a chunk of land in the middle of Tennessee with just 13 elephants roaming around it, is always accepting new residents. Asian elephants at the sanctuary have 2,000 acres all to themselves. "We stand ready to help ... ready to receive any elephants," she said. "Our doors are open."